I’d heard the term “homeopathic” used before. I’ve tried herbal supplements, essential oils, tinctures for many of my personal needs throughout the years, but only learned of the amazing benefits of homeopathic remedies just recently. On my way to a show, my spouse and I stopped in a great health food store called Abundant Living in Cleveland, Tn. We always stop by this store on our way to North Carolina each July. I’d noticed my lower back had been sore the past few days, but didn’t think much of it. As we were browsing around, picking up choice items, we spied displays of blue tubes, which looked like a chap stick tube on first glance. As we read through the display and literature, we discovered a new world of healing. 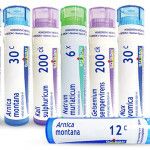 All kinds of tubes for all kinds of ills, ailments, you name it. If you need help sleeping, or reliving stress, or tackling that nasty cold or allergy, it was all there. I was fascinated. On a lark, I picked up my first tube, Kali Carbonicum, which addresses pain in the lower back. I also picked up another tube, Ignatia Amara for nervousness due to everyday stress. In using these blue tubes, you dispense five tiny pellets into the cap, pull off the cap and let the pellets land under you tongue. Close your mouth, and let them dissolve. Do this three times a day until the tube is empty. There’s enough remedy for about five days. In about two days, the pain was nearly gone! By day four, gone. I had a cold last week, due to allergies, most likely, and I tried the Kali Bicromicum. I saw fast results in comparison to using traditional over-the-counter cold medicine that leaves you dopey and draggy. The remedy kept me alert, feeling better, and cut drastically down on the thick, nasal discharge I had. Before I started the Kali B., I had used almost one roll of toilet paper and filled a whole plastic grocery bag with paper from blowing my nose. On the second day of taking the remedy, the toilet paper and new bag were drastically decreased to a few tosses into the bag. The pellets look like nothing more that sugar candy. But don’t be fooled. The sweet taste is to mask any herbal taste. You know how delicious medicine is, right? Okay, point made. So what’s in this? Think about all the herbal remedies and other extracts from products we use to address maladies. These pellets contain elements of these products, and go to the heart of the problem. The ingredients puts your body back in balance, slowly, gently, without the side effects that modern medicine has (though I believe modern medicine has its place). These remedies are not magic bullets, so don’t think you’re going to get an instant fix. They do, however, work faster than you’d think. They’re affordable, and there are multiple choices for all kinds of bodily discomforts and imbalances. Starting out a tinctures, the products are continually diluted until much of the true product remains, offering a power-packed punch to your problem. The doses commonly seen are 6C and 30C, which means 6C covers a more local area where problems occur, and 30C takes on a more global effect. However, a tincture at 30C has more of the pure active products, and thus is stronger in it’s healing properties, though it’s been diluted up to 30 times. 6C has more crude matter, but still delivers power and cure to the area it addresses. What’s interesting is that a tube’s ingredients also benefit other areas of the body, though it’s chosen to act more on a specific issue. At Stardust, we carry the 30C blue tubes for the most common conditions, hoping to add more of the line to fit our customers’ needs. Allergy season has kicked in, cold and flu season is around the corner, and there are a host of other conditions you may want deterred or stopped. 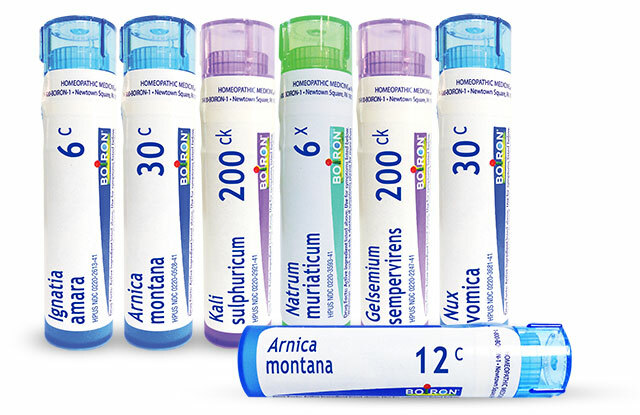 If you haven’t tried homeopathic remedies, Boiron’s Blue Tubes is a great way to start.